Taking the art of quilting to a whole new level, Leela Cheriana��s works are a breathtaking example of passion and most of all, patience. a�?My husband says I should say each piece takes between three months and 30 years,a�? laughs Cherian who has successfully exhibited in the US and the Middle East, with her second show in the city this month. Describing herself as a a�?fabric artista��, Cheriana��s depictions (cheriandesign.com) are largely pictoral with a particular fascination for birds, people and panoramic scenes. Pieces range between small intricate squares of 8 x 12 inches to large colourful 5 x 4 feet tapestry-like works of art. Cheriana��s technique is highly skilled with meticulous attention to detail. She uses purely hand-dyed fabrics in astonishing colours and rich weaves a�� from gauze and cotton to lace, velvet and silk. Her current collection will feature her classic landscapes as well as special, tapestry additions. Cherian has appeared in several books related to the field as well as on HGTV, a home and lifestyle television channel in the US. She uses fabric as her medium and the sewing machine as her paintbrush to create and interpret visuals that catch her fancy and imagination. a�?I dona��t stick to a particular theme because I personally find them quite boring,a�? 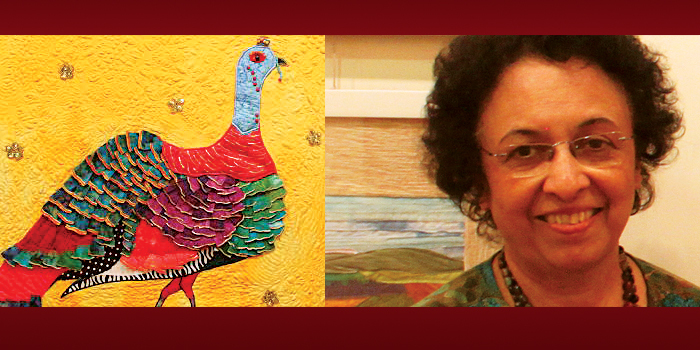 opines Cherian who prefers to constantly challenge her repertoire. This exhibition, titled The Magic of Fabric, includes two new styles a�� free-fall crochet and canvas embroidery. a�?I want people to see the possibilities of the art that until the early 90s was restricted to conventional quilts used as bed linen,a�? she shares. While free-fall crochet has no set patterns, canvas embroidery starts with a sketch which is filled in at random with embroidery, giving it a multi-textural, abstract feel. a�?All the fabric is hand-dyed and pieced together by me. Something I dona��t think anyone else in the country does,a�? Cherian concludes. Rs5,000 upwards. Till December 27.